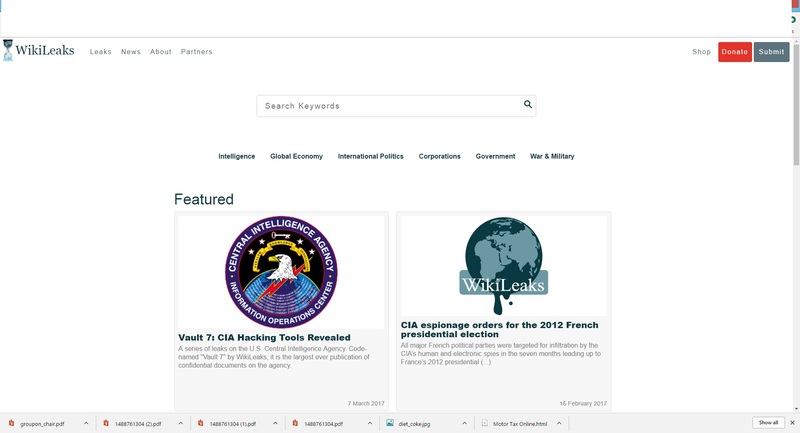 Wikileaks reveals CIA hacking tools in so far as publishing documents which they released on the their website on the seventh of March. Hacking isn’t a new phenomena and all intelligence agencies are likely to have methods to hack modern technology to find material on people who they have under surveillance. It may come as a surprise to some people but pimply faced teenagers are not the only source of malware on your computer, your mobile phone and lately your tv (smart tvs largely sold by samsung). It is quite a wide net when it comes to intelligence gathering and cyber-warfare, they seem to want to keep tabs on the general population rather than targeted suspects who would be easier to “bug” or wiretap. Also infecting computer systems would allow them to be taken down in the event of hostilities breaking out, power generation and communications are likely targets and present a significance security threats to most nations. It is reputed that all software has bugs in it which can be activated by a certain sequence being sent to the computer which has been infected. Though I am unable to prove it but as they say “bugs in the software flash the message there’s something out there”. Protection of vital computer systems is a essential component of national security in the event of cyber-war. More measure have to be taken to protect people’s privacy, financial details and more industrial applications. Computer systems require through examination with both the software and hardware being scrutinized. Both hardware and software are reputed to come with “back doors” -remote administration which are easily exploited by hackers. Manufacturers have to take seriously computer security and not have people surprised by packages installed on their computers. Technology has enriched people lives by letting them do more but sometimes maybe the less technology is the better option.